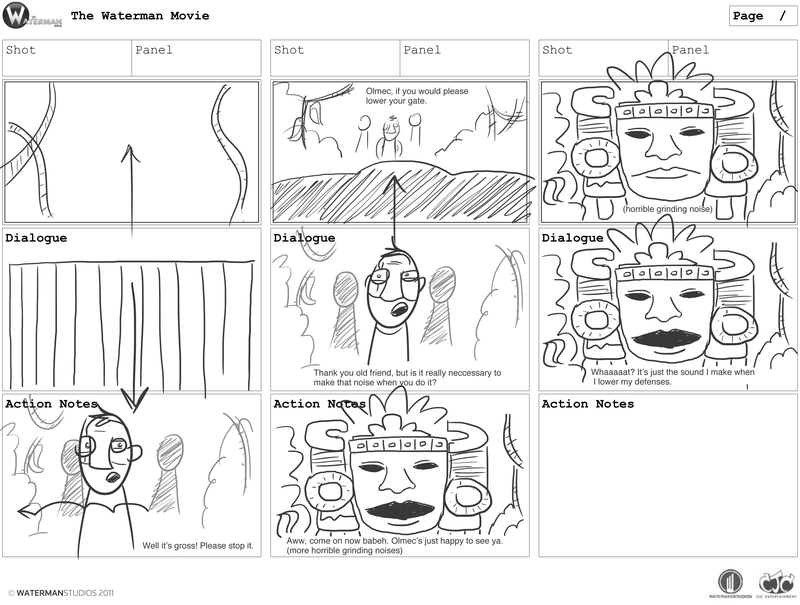 We’ve been moving right along here with The Waterman Movie. Right now, we’re finishing up some of the storyboards and putting the finishing touches on some of the character designs before moving further into animation in December! As much as I would love to be able to show you everything we’ve been working on, some things still need to be kept a secret. However, from time to time I will be posting little sneak peeks here on the site. The above storyboard is for a joke that I’ve been wanting to use for a long time now. For those of you who are unfamiliar with Olmec, he’s the giant Aztec-ian rock face from Nickelodeon’s 90′s hit Legends of the Hidden Temple. Every time Olmec would lower his gate to allow children to rummage through his templed innards, he would let out this horrible grinding noise (EXACTLY LIKE THIS) and an unspeakable discomfort would drape itself across the faces of everyone. Hah, I remember that show. I don’t see how that noise is annoying though.